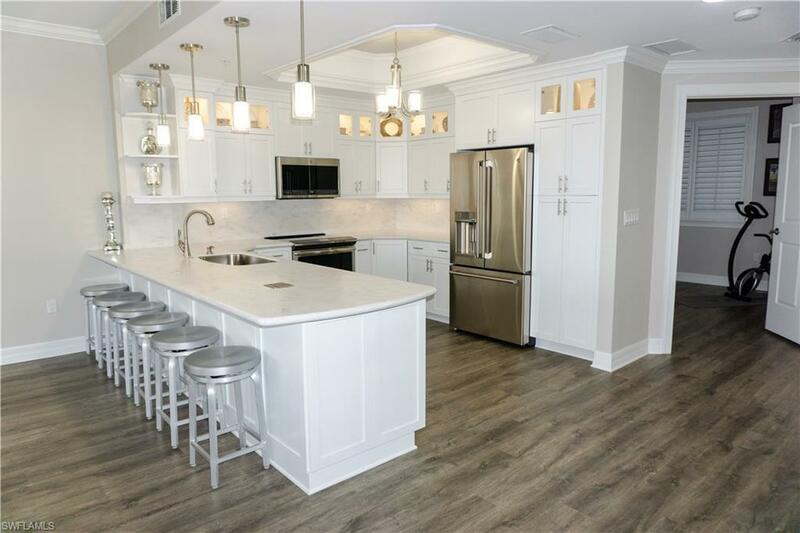 Gorgeous one of a kind unit in North Star Yacht Club! As soon as you walk in this fabulous condo the first thing you notice are the floor to ceiling windows with incredible views of the canal and the Caloosahatchee River. With expansive views of the water from almost every vantage point, including the large open lanai, you feel like you are living in a resort. Everything in the entire unit is brand new including the kitchen with beautiful custom cabinets and designer lighting throughout. The kitchen footprint was expanded, including the tray ceiling, and the counter area was enlarged to give you plenty of room to entertain. Pop up electric outlets were added and the refrigerator can even make coffee! This condo is truly one of a kind. High tech touches were also added in the den with wireless in counter phone charger. Custom built-ins give the room form and function and there is also a Murphy bed ready for the occasional overnight guest. North Star has one of the best amenity packages, 24 hour guard, space for your boat, and all with reasonable HOA fees. Fantastic location, 5 minutes to downtown Fort Myers or within walking distance to several waterfront restaurants. See it today!